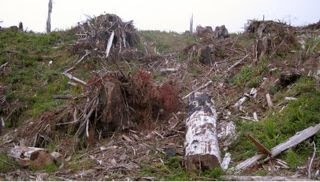 THPBlog: Green Diamond Resource Company to clearcut log east of Patrick’s Point State Park. Green Diamond Resource Company to clearcut log east of Patrick’s Point State Park. This THP is about 5.5 miles NE of Trinidad, CA near Highway 101 at an elevation of 200 to 970 feet. Green Diamond Resource Company is planning a mostly clearcut feller buncher, shovel and cable logging operation in redwood, Douglas fir, Sitka spruce, grand fir and bishop pine forests. The THP area is just east of Highway 101, opposite Patricks Point State Park, a popular camping, hiking and beachcombing area. There is landslide terrain including stream bank erosion in units C, D and E, and shallow landslide features in units B and E. Four short segments of road are proposed over 15% grade, and 2 short segments of road are proposed over 18% grade. An osprey nest is located within .25 mi of unit B, and a pacific fisher was seen in unit B. More information is available on the THP Tracking Center website.